Each year, I toil with the notion of how much of the yard I am going to be able to surreptitiously convert from lawn grass to some new and exciting flower or vegetable garden area without it ending in unnecessary marital stress. While I shape up garden borders here and there, there is a standing compromise that there will be an actual yard, and not all garden. So, since I have to have a front yard, I wanted it to be nice, and ours has been very far from that for years. It’s worth considering a “Start Over” if your lawn grass is 50% or more A) overtaken by stubborn weeds year after year, B) suffering widespread pest or disease damage, or C) just unsightly for any combination of those and other causes. As is quite common in men, I suffer from a degree of color-blindness, which is not ideal for someone who spends countless hours gardening. 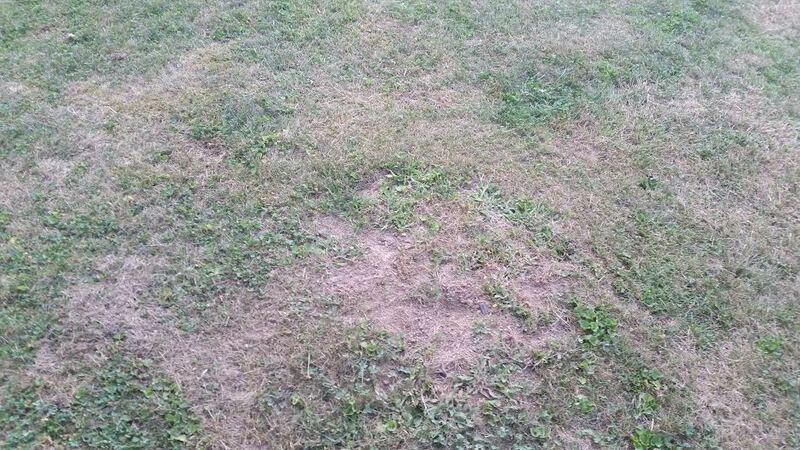 That said, even I can tell that the below photo of my front lawn grass is an ugly, spotty, dull, green and brown mess. 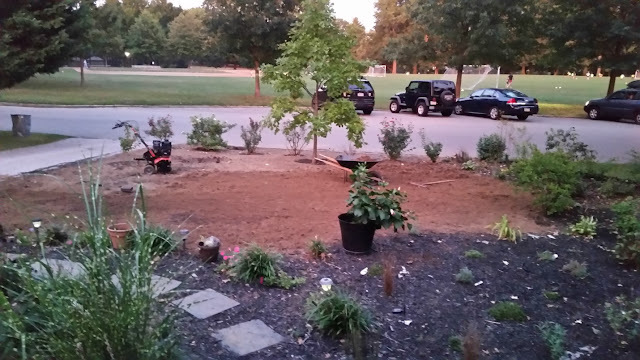 Between fall 2015 and spring 2016, I had used leaves, cardboard, and mulch to snuff out old grass to form the border of the front walkway and garden area next to it (pictured in next photo). That method translates nicely into creating a garden, as it can be left in place and planted through. However, to “Start Over” a larger grass lawn area, I wanted to use something a bit more uniform and easier to put in place. Also, I didn’t want to use leaves or mulch, since it would be a place for new grass after the doomed weed lawn below the cover was killed off. I do not use chemicals, so spray was not part of the plan. The purpose of my plan was to both avoid chemicals leaching through the soil and into the local system, and also avoid sheering off valuable layers of soil by digging the grass out. So, I started by mowing it down as low as I could and giving it a good soaking. This puts the remaining turf, which can be stubborn, in best position to fail. 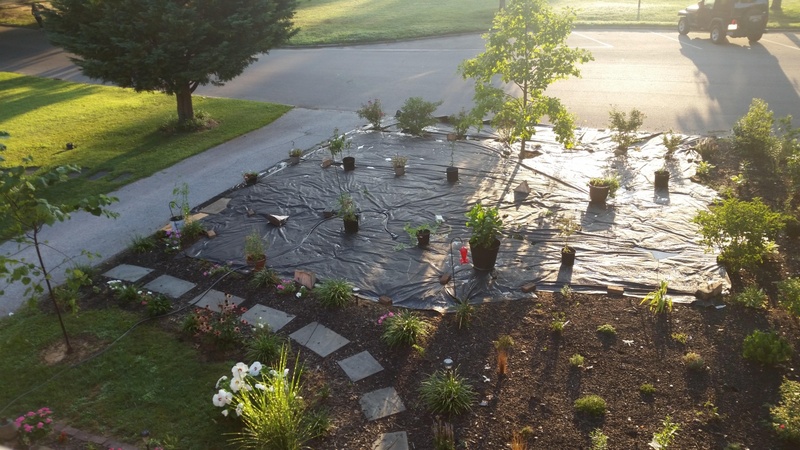 Then, after a modest investment in 20 mil plastic sheeting, which I spread across the lawn, I utilized all kinds of objects found around the house to hold it in place. Next, I just let late summer heat coupled with no sunlight or water for about 6 weeks to kill off the messy, old neglected lawn. Avoiding chemicals is a great option, but the tradeoff is harder work, and more neighbors, joggers, dog-walkers, mail carriers, and everyone else interrogating you about the 1.5 months of a black, plastic for a front yard. I made sure to take the opportunity to explain the entire project to the many people stopping to ask before continuing on to the park across the street. When average temperatures were between 60 and 80 degrees (best for grass seed), the plastic came up, and I got right to pulling up the dead grass, weeds, and roots. Not every spot was as simple to tackle as others, so again, I don’t want to gloss over the hours of hard work involved in this part of the project. It was not easy or fun, but the payoff kept me going. Also, I noticed spectators were now making an extra trip or two, slowing down to see progress and check on my well-being at times where I was struggling a bit with the effort. I was able to pick up a tiller on the cheap, capitalizing on a summer inventory-clearing situation at my local Lowe’s. I figured this would be a good machine to have for other PSU Master Gardener events. It will travel nicely in the old Jeep. Hand tools will work, or local hardware stores rent out tillers, too. 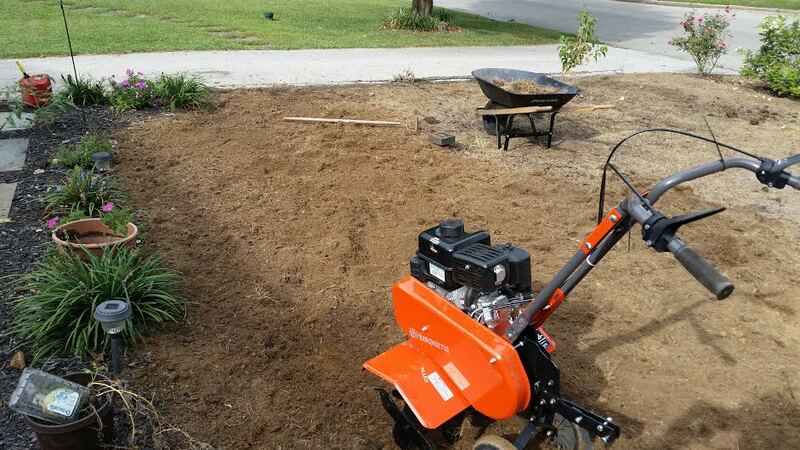 Once all the old grass was removed, the soil tilled and raked (the grubs didn’t survive the process! 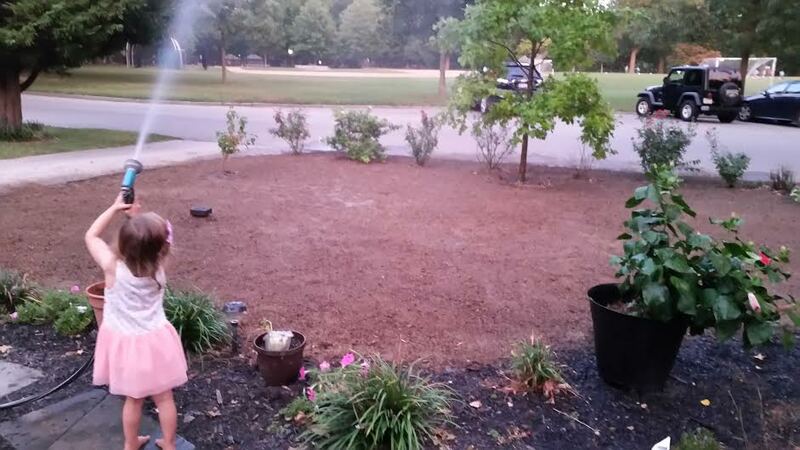 ), it was time to seed, continually water, and await germination. I took help where I could get it. My daughter was excited about turning 3 and showed it off by helping daddy grow new grass by watering while I sat down and rehydrated. Allow the new grass to grow at least four inches before even light traffic or mowing. The loose soil does best if you can avoid any compaction as new roots are forming. Those roots are the reason fall is an ideal time to do this. 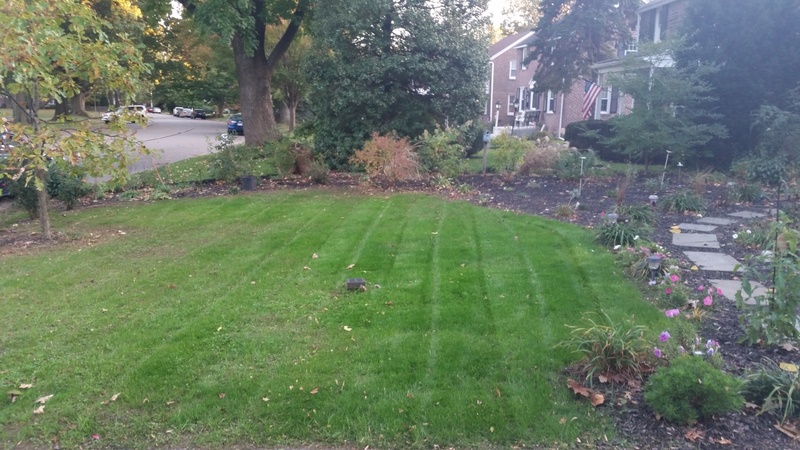 Come spring, you’ll have a head start when your dormant grass “wakes up” and grows even more root base than spring seeding would produce before the summer heat puts stress on the grass. There are plenty of resources out there with more details about the types of grass blends to choose, especially for our area. There are guides that go into greater detail about the steps involved. Don't expect a “one size fits all.” Shop around and take what you like and leave what you don't. Good luck with your “Start Over” if you choose to commit! It is a very rewarding project.